Flooring The Consumer: Different & Better Enough to Make People Care? Different & Better Enough to Make People Care? 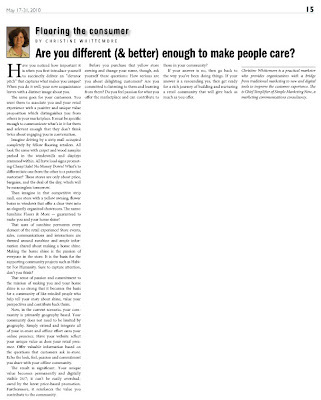 This article titled Are you different (& better) enough to make people care? 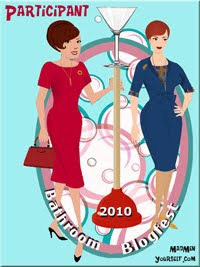 appeared in the May 17-31, 2010 issue of Floor Covering Weekly. Figuring out how you are different from competitors is critical to being successful in business. It comes up in every presentation I take part in. It's the basis for a strong marketing strategy, for creating memorable content and for making strong use of social media tools. Do you know what value you contribute to your community? Do you know what makes your retail experience different and memorable for your customers? 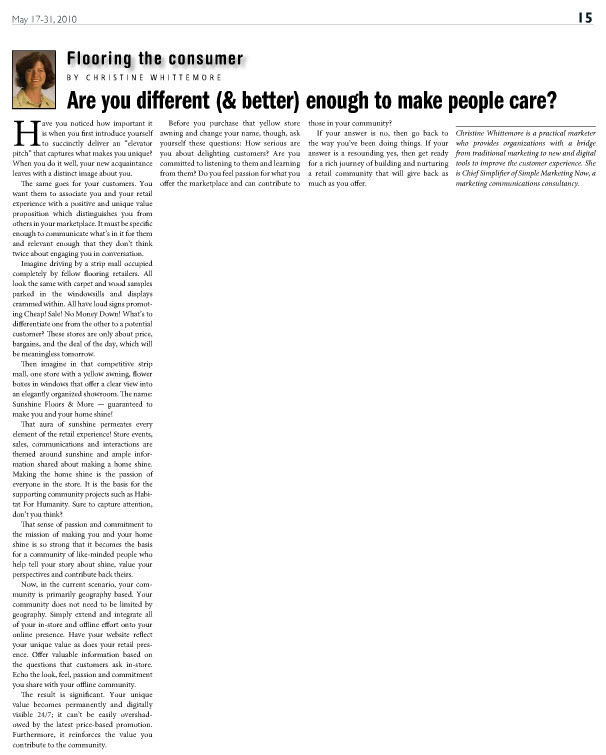 Are You Different (& Better) Enough To Make People Care? Have you noticed how important it is when you first introduce yourself to succinctly deliver an ‘elevator pitch’ that captures what makes you unique? When you do it well, your new acquaintance leaves with a distinct image in his/her mind about you and the relevance you offer. The same goes for your customers. You want them to associate you and your retail experience with a positive and unique value proposition which distinguishes you from others in your marketplace. It must be specific enough to communicate what’s in it for them and relevant enough that they don’t think twice about engaging you in conversation. Once you start the conversation, you have the basis for building a relationship which may then lead to sales, satisfaction, word-of-mouth, and a retail community. Imagine driving by a strip mall occupied completely by fellow flooring retailers. All look the same with carpet and wood samples parked in the windowsills and displays crammed within. The first store is called Al’s Flooring, the second Bill’s Floors, the third Charlie’s Carpets and so on. All have loud signs promoting Cheap! Sale! No Money Down! What’s to differentiate one from the other to a potential customer? These stores are only about price, bargains, and the deal of the day which will be meaningless tomorrow. Then imagine in that competitive strip mall one store with a sunshiny yellow awning, flower boxes in windows which offer a clear view into an elegantly organized showroom. The name: Sunshine Floors & More – guaranteed to make you & your home shine! That aura of sunshine permeates every element of the retail experience! Store events, sales, communications and interactions are themed around sunshine and ample information shared about making a home shine. Making the home shine is the passion of everyone in the store. It is the basis for the supporting community projects such as Habitat For Humanity to bring sunshine to other homes and homeowners regardless of their means. Sure to capture attention, don’t you think? That sense of passion and commitment to the mission of making you and your home shine is so strong that it becomes the basis for a community of like-minded people who help tell your story about shine, value your perspectives and contribute back theirs. They gather based not on the price of floors, but rather because of shared affinity, a much more powerful and long-lasting basis for a community. Now, in the current scenario, your community is primarily geography based. Those in your immediate geographic community have become aware of you and associate your flooring store with sunshine and making both customer and home shine. Fantastic! Your community does not need to be limited by geography. Simply extend and integrate all of your in-store and offline effort onto your online presence. Have your website reflect your unique value as does your retail presence. Offer valuable information based on the questions that customers ask in-store. Echo the look, feel, passion and commitment you share with your offline community. Make use of the tools of social media and offer educational advice on how to care for floors on your blog, post photos of your in-store Habitat For Humanity event on Facebook and share links to articles about eradicating homelessness in your town on Twitter. The result is significant. Your unique value becomes permanently and digitally visible 24/7; it can’t be easily overshadowed by the latest price-based promotion. Furthermore, it reinforces the value you contribute to the community. Before you purchase that yellow store awning and change your name, though, ask yourself these questions. How serious are you about delighting customers? Are you committed to listening to them and learning from them? How determined are you to be more than a commodity player? Do you feel passion for what you offer the marketplace and can contribute to those in your community? Are you not just willing but determined to share your knowledge and interests with others? If your answer is no, then go back to the way you’ve been doing things. If your answer is a resounding Yes!, then get ready for a rich journey building and nurturing a retail community that will give back as much as you offer.